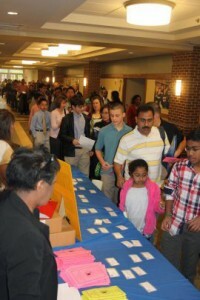 With 97 contenders from across the state, the Virginia Geographic Bee was held at Shenandoah University on March 30. Eight preliminary rounds were followed by a tiebreaker session among 19 students who had perfect scores. The tiebreaker lasted 15 rounds, but at last the group was narrowed to ten finalists. The elimination process continued before a packed auditorium until two students were left to battle it out in the championship round. 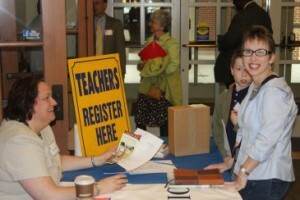 Students and parents arrive and pick up registration materials. While the preliminary rounds were being held, parents, siblings, and teachers in attendance were able to explore the National Geographic Map of Africa, a large floor map that is loaned to schools for student lessons. 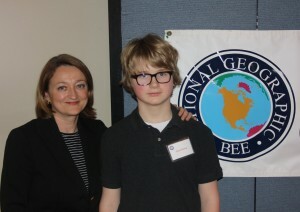 The winner of the 2012 Virginia Geographic Bee was Kevin H. Zhan, representing G. H. Moody Middle School in Henrico. He will compete in the National Geographic Bee in Washington, D.C., on May 22-24. Alex Trebek of “Jeopardy” fame will be the moderator. Peter J. Rohrer of Kilmer Middle School, Vienna, finished in second place; Ian V. Rector from Robert Frost Middle School in Fairfax finished in third place. Congratulations to Kevin, Peter, and Ian, and indeed to all contestants. You are all winners! Kevin Zahn, winner of the 2012 Virginia Geographic Bee, with his parents Yin Huang and Dongliang Zhan. Peter Rohrer was runner-up. His parents are Christine and Karl Rohrer. He is shown here with his mother. 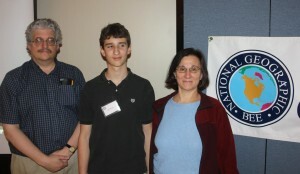 Ian Rector, third place finalist, with his parents, Laurie Rothenberg and Robert Rector.